What are School Based Apprenticeships & School Based Traineeships? Whether you want to enter the workforce right after school or go on to Uni, a school-based apprenticeship or traineeship allows you to develop the skills and knowledge employers and tertiary institutions are looking for. You can work as a paid employee and obtain a recognised qualification, all while you’re still at school. There are more than 600 qualifications that you can do through a school-based apprenticeship or traineeship so you’re bound to find one that would suit your needs and interests. School-based apprenticeships or traineeships can broaden your horizons and gives you a headstart before you have even finished school. To do a school-based apprenticeship or traineeship you still need to be at school and you’ll need to work one day a week. Your school will work with you, your parents, your employer and your training provider to make sure your apprenticeship is a success. School-based apprenticeships or traineeships are generally for students in Years 10, 11 or 12. As an Australian Apprenticeship Support Network (AASN) Provider, BUSY At Work can assist Queensland students and through our partner CoAct, we assist Western Australian students as The Apprenticeship Community. Our Industry Training Consultants should have regular contact with your Industry Liaison Officer (ILO) and will advise them of local employers wanting to add value to their business using school students in their region. 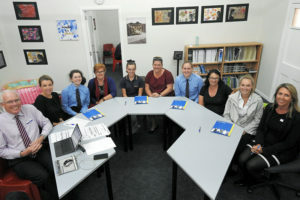 Learn why the Glennie School in Toowoomba employs their own students as trainees. Does it fit ‘your plan’? Apprentice and trainees may only access a maximum of two government-funded training contributions. It is important that students (and their parents or guardians) consider if the SAT is appropriate and relates to the student’s future chosen career. Do you have support from your school? Discuss how a school-based apprenticeship or traineeships may assist with Queensland Certificate of Education (QCE) points and underpin tertiary study. Will you have work / school / training / life balance? Develop strategies to balance the additional workload of school, work and training. Have you got transportation options? Work hours may be different, do you still have reliable transport to and from work? What happens when you finish school but not your training? Some students complete their traineeship while at school. All school-based apprentices and some school-based trainees however will finish school without having completed their training requirements. To complete your qualification you’ll need to convert your working arrangements to either a full-time or a part-time level. Here’s some extra information to assist you in deciding whether a school-based apprenticeship or traineeship is right for you. Below you’ll find some School-Based Apprenticeship and School-Based Traineeship vacancies in Queensland. There’s plenty more available, talk to your Industry Liaison Officer (ILO) and review all job vacancies on apprenticeshipcentral.com.au. THE BUSY GROUP LTD trading as BUSY At Work is a service provider contracted by the Australian Government as represented by the Department of Education and Training to provide support services to prospective and current employers and Australian Apprentices. THE BUSY GROUP LTD is one of a number of Network Providers in Queensland and Western Australia. This website does not represent the Australian Government, if you wish to access information about the Australian Apprenticeships, from the Australian Government you should access the Australian Apprenticeships website. Please fill out all required fields below.